Retail shareowners own about 1/3 of shares traded in the United States but vote only about 1/3 of the shares we own. As Nell Minow once quipped, “you can lead a shareholder to a lot of dense material, but you can’t make them read it.” (Video Friday: SEC Proxy Voting Roundtable) Our voting influence is much smaller than it could be. If more retail shareowners not only voted but participated in discussions on corporate governance and in filing shareholder proposals, that might lead to greater accountability of managers and boards. Of the five, Proxy Democracy is the only that is currently operational. Key to its survival has been low cost through automation and the dedication of its volunteer founder and board. We can’t expect that to continue. 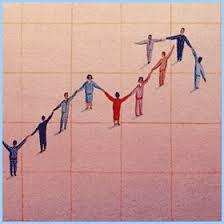 Additionally, although Proxy Democracy provides great services, they are limited. How can we do better? 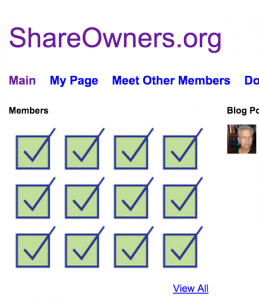 In this post I briefly speculate on what could be done by recalling some of the better features of each effort and possible improvements that would help conscientious shareowners. The feature I use most often on Proxy Democracy is the compilation of votes announced in advance of upcoming meetings. For example, Steris Corp has a meeting coming up on August 27th. Proxy Democracy has already collected the votes of two funds and may collect more by the time I vote, usually about a week before the meeting. The company’s long term incentive compensation is not sufficiently tied to financial performance.The CEO’s total pay exceeds 4 times the average NEO pay. Most people aren’t going to read the proxy, so the simple table and any reasons provided can certainly influence analysis and voting behavior. I find these explanations especially helpful when a fund appears to be voting contrary to most others. Technology today makes disclosure “rapid and informative.” Yet, corporations are not required to make the disclosures to shareowners as Justice Kennedy seems to have believed. How can we, as shareowners, hold corporate managers accountable when we do not know what candidates or measures they are supporting? Looking at Proxy Democracy I can see that Fidelity and Vanguard abstained on that .vote at Apple. Proxy Democracy used this historical information to create fund profiles in four issue areas that I found very helpful in helping me choose mutual funds to invest in. For example, if I am investing in an S&P 500 index fund, why not invest with a firm that votes my values, all other factors (such as fees) being equal? This historical information isn’t critical for my behavior as an investor in individual stocks but it was nice to have when investing in mutual funds. I was also helpful to me in evaluating funds in my 401(k) plan (Savings Plus: Transparent Proxy Voting Needed). The most innovative feature of MoxyVote was the ability to tie into your brokerage account, although not all brokers or users participated. Holdings by all participating Moxy Vote users could then be reported in aggregate although no one but you and your own broker knew how many shares you held. So, for example, Moxy Vote could claim that participants owned 10% of all shares XYZ company and that fact gave discussions on the site more weight. The Moxy voting platform allowed you to essentially set a policy of voting along with pre-disclosing funds. Early on, this wasn’t much use because the issue oriented participants only gave voting advice on a few proxy items. However, by the time Moxy Vote went out of business they were collecting voting advice not only from issue organization like PETA, but also most of the fund votes collected by Proxy Democracy… most importantly CalSTRS and Florida SBA, since they own stock in most companies. I could set my account to vote like PETA, followed by a lot of if then scenarios. If PETA hasn’t voted on the item, vote like Domini; if Domini hasn’t voted, vote like CalSTRS, etc. I could also verify or change the vote before it was executed. Although the voting platform was very innovative and certainly made voting easy, it was expensive to operate. Every time someone voted on the platform, Moxy Vote needed to pay for that service. Much of the same benefit, without the expense, could be achieved by a similar system that isn’t tied to brokerage accounts. The system could simply deliver a pre-filled proxy to users based on voting alongside pre-disclosed voters or through use of algorithms as described near the end of Announcing Proxy Votes Improves Corporate Governance. Users could simple pull the pre-filled proxy up in one window and fill out their proxy using that guidance in another. 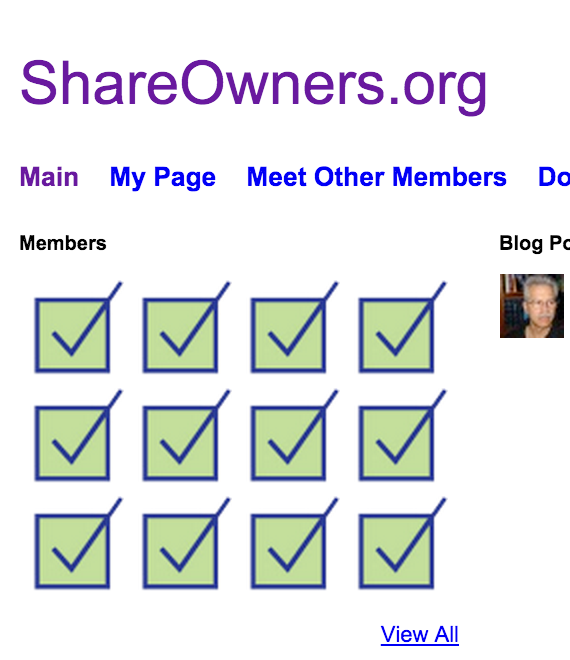 More on facilitating votes and activism among retail shareowners in Part 2.